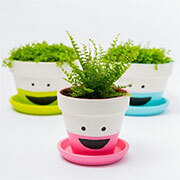 As the weather gets cooler and we look at moving indoors, adding some colourful flower pots and indoor plants to rooms brings the outdoors indoors and helps keep the air fresh. It isn't always easy to find the perfect fabric for all your projects, and this is when you will want to create your own fabrics using fabric paint or acrylic craft paint. 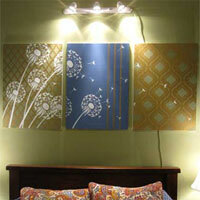 This quick project lets you make your own wall art - in any colour - to fill up a blank wall. 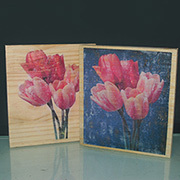 Transfer an image onto wood... easily! If you want to transfer an image onto wood, there are quite a few easy ways to do this using supplies you can buy at any Builders store. 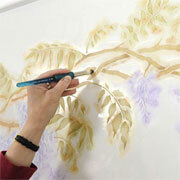 Create a unique design to walls using this affordable way to stencil on walls. 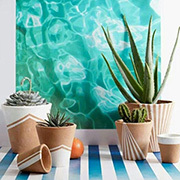 Give your flower pots a new look for spring with these crafty ways to decorate flower pots. 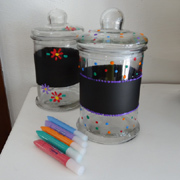 I love using Sharpie pens for crafts; there are so many wonderful colours to choose from and so many ways to use a Sharpie pen. 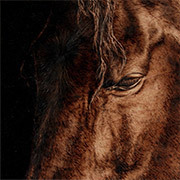 Pyrography - or wood burning - is an art itself, but Julie Bender takes it to another level with her gallery of works. 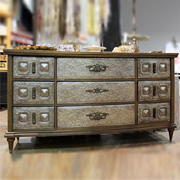 If you're looking for an easy way to update furniture or to give it a custom look, why not try your hand at decoupage. 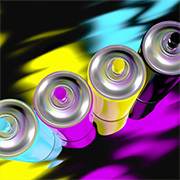 Which spray paint is the best brand? With so many brands of spray paint on the shelf at your local hardware stores, it's hard to know which one is right for your project. 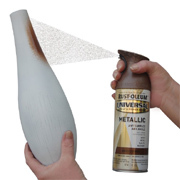 Here are a few facts to note when next buying spray paint for your craft or DIY project. 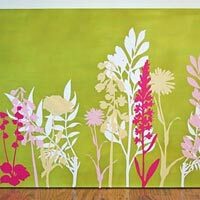 Foam sheets are available at craft stores and online suppliers, and are a great way to make your own stencilled fabric designs. 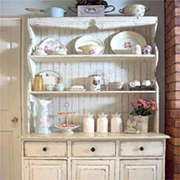 Before starting on painting project, take a quick read through these top three tips designed to have you upcycle-ready in no time. 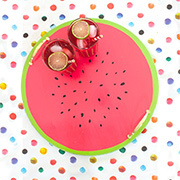 Add some colour and fun to your entertaining with this watermelon tray. 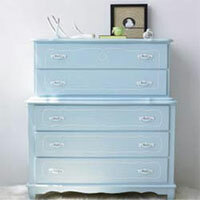 All you need is a piece of pine, some craft paint, and a couple of handles and screws. These two children's chairs had broken seats, and the seats and backs were only 3mm hardboard and needed to be replaced. They were also covered with layer upon layer of paint, which wall full of runs. 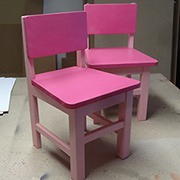 The backs and seats were removed and replaced and the chair frames sanded and sprayed with Rust-Oleum satin sweet pea and gloss berry pink. This project details how a chest of drawers is transformed using paint, scrapbook paper and ModPodge and showcases how you can take an old fashioned piece of furniture, like this chest of drawers, and turn it into a prized possession that you want to have out on display. 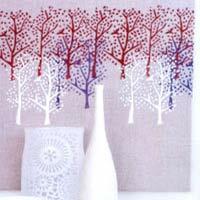 You can use a glue gun for various projects, but here's a way to use a glue gun to make colourful wall art - and you can make any design you like. You know I'm a big fan of Rust-Oleum spray paint and I am always on the lookout for ideas for using spray paint in fun ways to add a splash of colour to my home. 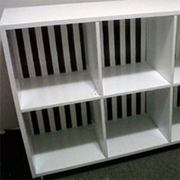 At a cost of around R80 per tin you can paint almost anything with Rust-Oleum; from plastics to wood. Rust-Oleum is not your average spray paint and offers high coverage even with one coat, which means one can goes a long way! I am definitely into painting crafts at the moment and the next item on my list is to paint up some Roman blinds for my kitchen. 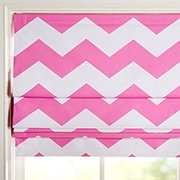 You will find easy instructions for making your own Roman blinds and I mention in the article that the most difficult part of making your own blinds is finding the right fabric. 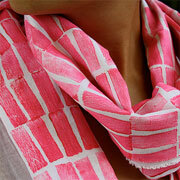 So, if you can't find fabric you like you could consider painting your own fabric! 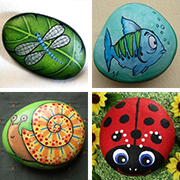 Painted pebbles are a fun way for the whole family to get involved in crafting. 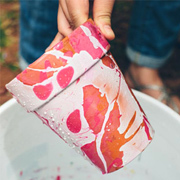 It's also a crafty idea if you are looking to keep the kids occupied during school holidays. You can buy a small bag of pebbles at your local garden centre or nursery, or collect them at the beach on your next holiday vacation. 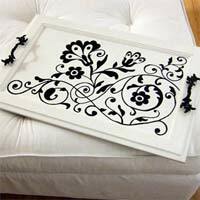 If you have plain wall that needs a bit of interest added, making a stencil and adding a pretty design is an easy and affordable way to dress up a bare spot with flair. 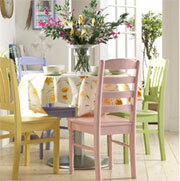 Choose a paint colour that complements your existing colour scheme, or go for a colour that really pops. Some of the wood stain colours that you find on the shelf these days are boring and old fashioned. Any easy way to make your own colourful wood stain is to use food colouring. In this article you will find out how easy it is to stain wood in any colour you want - easy and affordably. 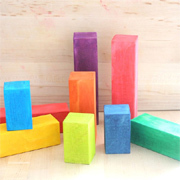 Grab some PAR pine blocks to practice on and start mixing up rainbow shades of wood stains. Turn 12mm PG Bison MDF panels into a colourful headboard with paint. Have 12mm MDF cut to size at your local Builders and then paint in colours and pattern that match you existing decor. 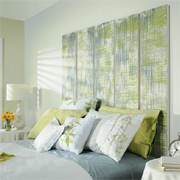 You can add as many 300mm-wide panels to create a headboard for any size bed. Spray or paint your serviettes! I have done a lot of things with spray paint, but making serviettes is definitely a first, although I have use spray paint for quite a few fabric projects. With a Rust-Oleum conference coming up I decided to show the many ways - other than the obvious - to use spray paint. The serviettes are cut from canvas drop cloth and the edges are frayed, although you can fold them and sew if you prefer a neater finish. I have been using Rust-Oleum spray paint on fabric for ages, since way back in 2005 when I first discovered that you can! I sprayed a chevron pattern on my cushions, made striped Roman blinds for the bathroom, and a tablecloth and serviettes. 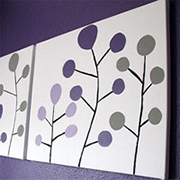 Using a stencil to create unique designs on canvas is a fun and affordable way to add your own personal touch to a room. 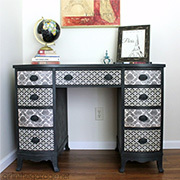 Some years back I posted an article on using lace and spray paint to dress up the top of a cabinet. 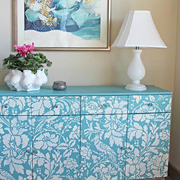 This technique has resurfaced all over the Internet and there are beautiful examples of lace spray painted furniture. 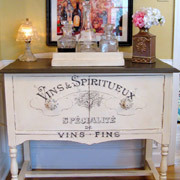 It's an easy way to dress up a dated piece and put a new twist on old furniture. 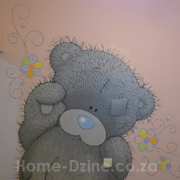 Imagine being able to paint any design as a wall mural - creating wall murals for a children's bedroom or nursery. The DIY Divas are proud to present a Wall Mural Painting Workshop in conjunction with Kaylynne Thompson-Jagga, graphic designer and artist extraordinaire. 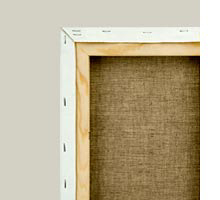 I have discovered many uses for canvas dropcloths that I buy from my local Builders Warehouse, and this is a great project for using up any leftover scraps that you may have lying around. Painting furniture is a wonderful way to update old furniture to fit into your space, as was the case with this old credenza. 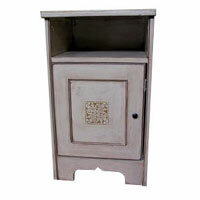 A stencilled design transform the cabinet into a stylish piece that now fits nicely into a guest bedroom. 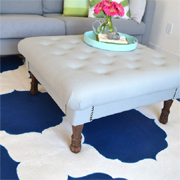 Painted rugs have become a trend as people realise how easy it is to do. If you use a quality paint and brush it into the pile of the carpet, a painted rug will last reasonably well depending on the amount of traffic, and you can clean by wiping with a lightly damp cloth. Using ceramic or glass liner pens and paints allows you to transfer designs onto ceramic and porcelain crockery to add a touch of your own personality to plain items. 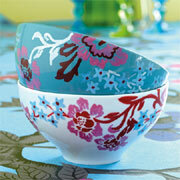 You will find ceramic or glass liners at craft and hobby stores, and they are available in a range of colours. 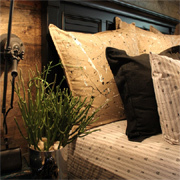 Over at the cavender diary a set of cushions are given an art-inspired paint treatment that transforms them from plain to unique. 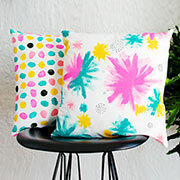 No special paints involved, these cushions were splashed with everyday household paint leftover from various home projects. 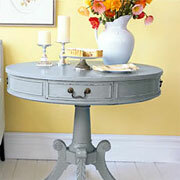 Dress up some plant pots with spray paint to create this charming cake stand. 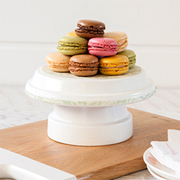 Easy to make, you can add your own personal touch to this cake stand to match your table decor or party theme. I love discovering old piece of furniture that can be painted and distressed, especially when you pick them up for practically nothing because people don't want them anymore. But even searching online classified can sometimes result in finding hidden treasures, or vintage pieces that haven't been cared for. I have been longing for a zebra print rug for ages and finally bought myself a large piece of canvas dropcloth and some Rust-Oleum Universal metallic in pure gold so that I can make my own zebra print rug. 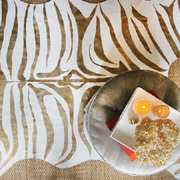 Once you've got the design done, painting and finishing your own zebra print rug is quite easy. This project shows how easily you can transform a chest of drawers, or any piece of furniture, into a wonderful show piece for a home. 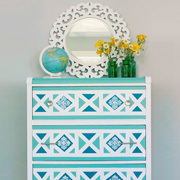 This plain chest of drawers is finished with a geometric design in aqua hues. 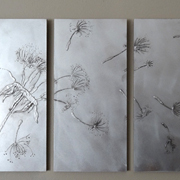 I have been wanting to make a dandelion triptych for ages and a recent experiment using relief paint and aluminium foil to make a picture frame got me to thinking about the perfect idea. My dandelion art is on MDF and uses relief paint, which is then covered with Rust-Oleum titanium silver spray paint. I love it...! I found this stunning project and this is definitely one I want to try... when I find the time, as I need a couple of rugs for various rooms in my home and just can't find what I'm looking for. 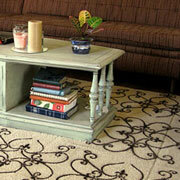 This painted rug is quick and easy to make and you can customise the design and colour to fit in with your decor. 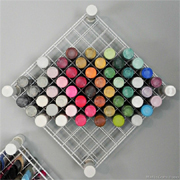 Here's a nifty way to make a craft storage centre for all your craft paints. 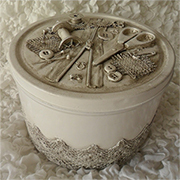 You can also use this craft storage centre for glitter, nail polish and lipstick, or cotton thread. 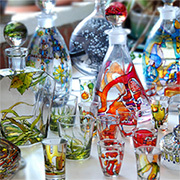 In fact, there are so many ways to use this craft storage centre. 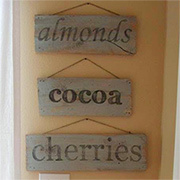 Hang one in a child's bedroom for storing crayons, pencils and kokies. As a young girl I remember cutting up potatoes to make my own stamps for projects. 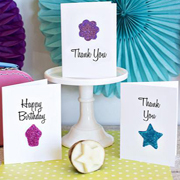 Potatoes were always readily available and easy enough to cut into shapes for stamping onto card and fabric. 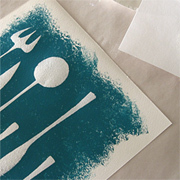 Today there are other options, but why fork out hard-earned cash when you can still use potatoes for creative stamping. What to do with a pair of headboards picked up at a bargain price? These solid Imbuia headboards are to valuable to ignore and it's amazing to see what can actually be done with a pair of old headboards. 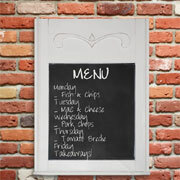 I find chalkboard menu boards very useful. You can hang them in the kitchen to remind you of groceries to buy, or what's for dinner, hang them in the laundry or home office, or make one for the kids to use. Grab a can of Rust-Oleum Chalkboard spray paint at your local Builders Warehouse and start spraying...! 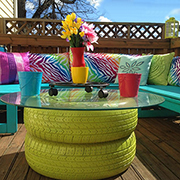 Sometimes all you need is a can of paint and you can transform dated or mismatched decor accessories easily and quickly. 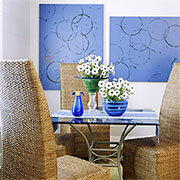 Here's an easy way to make your own art with Rust-Oleum Universal - pure gold - spray paint and canvas frames. 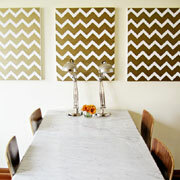 Repurpose old canvas art and transform them using masking tape and Rust-Oleum Universal spray paint in pure gold. 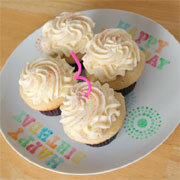 For children's birthday parties you can easily decorate a few paper, melamine or ceramic plates for the occasion. 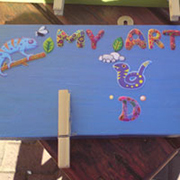 Marie at makes and takes has a project to make a painted party plate can be used over and over again. 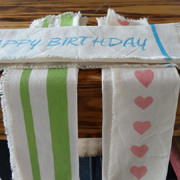 Block printing is a fun and affordable way to create your own unique fabrics using nothing more than your own printing blocks and paint. 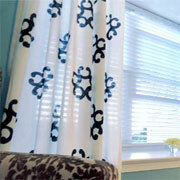 If you use matt acrylic paints your designs are washable and you can design an unlimited selection of fabrics. It doesn't take much for me to find ways to use spray paint. Having previously tried my hand using an artist's spray gun, I found it fun to grab a couple of cans of Rust-Oleum for my 3-seasons apple tree art. 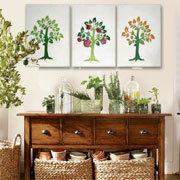 This art signifies spring, summer and autumn. I would have added winter but didn't have enough room on the wall! Although these aren't tin ceiling tiles, you can easily paint modern plastic ceiling tiles to look vintage, and then transform into an antique finish clock. In this project we show you how to paint plastic ceiling tiles to look like vintage tiles, and then make your ceiling tile into a clock. 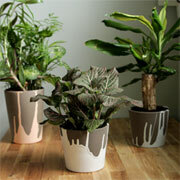 More paint dipped plant pots - the easy way! 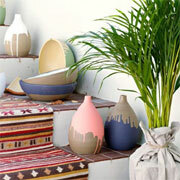 I have originally posted on paint dipped decor and how it's becoming quite a trend. 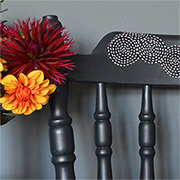 I came across this project that shows an easy and simpleway to apply a paint dipped finish. 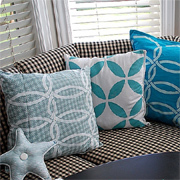 Instead of forking out your well-earned cash on expensive fabric accessories, why not get creative with fabric and fabric. 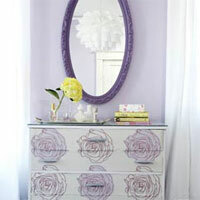 There are so many creative ways to have fun with paint and provide practical solutions for home decor. We have included a couple of projects that show how easy it is to use paint to highlight a feature on a wall. 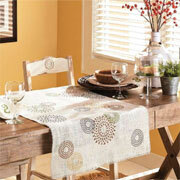 This charming table runner features flowers that give it a contemporary touch. 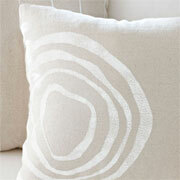 The runner is made from durable burlap fabric that’s covered in fun stencilled patterns. 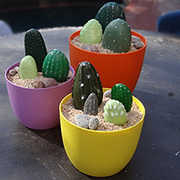 I accidentally stumbled upon some images of paint dipped baskets and thought that this was a great way to add interest to baskets, flower pots and other home decor items. Although, if you are planning to do this, make sure you collect together more than one item to paint dip, as it can otherwise work out very expensive. I love making over an old piece. 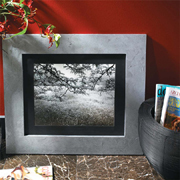 It gives it new life, new potential and in doing so, can totally change the look of a space. 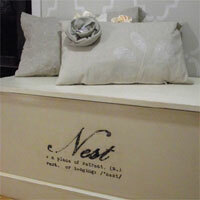 Stencils are perfect for DIY decor: easy, economical and fun! You can stencil with a roller or a stencil brush. 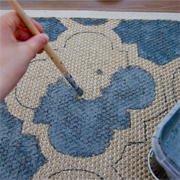 Paint a rug with spray paint! I recently came across a post where a rug was painted with a stencil design. Having used my Rust-Oleum spray paints on fabric and furniture, there's no reason why you can't use it on rugs and mats as well. 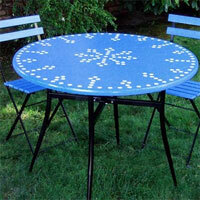 How to paint a table with a stencilled design. Follow these easy step-by step instructions. I stumbled across this lovely project for a task board that the kids (and parents) can use to keep track of what needs to be done on a daily basis. What a great idea! I know many detest brochures that find their way into our mail boxes. Even though I complain about them as hard as the next person – I will always have a complete scan of all things nice. And all things are possible with a little determination and imagination. 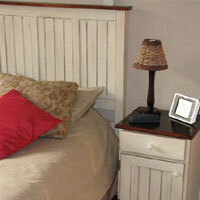 Take a plain, wooden blanket box and transform it with paint into a wonderful treasure for a bedroom. 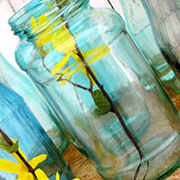 Use paint to add colour to glass jars for a decorative accent in the home. 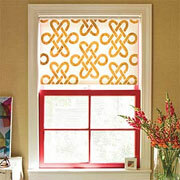 It's easy to makeover a set of plain curtains (or cotton flat sheets) with fabric paint and stencil. 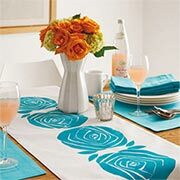 There are no fancy techniques involved; simply find a design that you like, cut out the stencil and stencil the design onto the fabric. 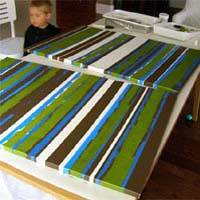 I love giving this project as a gift to my friends' children, as they love to display their works of art. An affordable but personal gift idea. 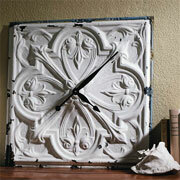 Sometimes older pieces cry out for a bit of TLC to restore them to stunning collectibles. Here's how to create a rustic finish on a wooden side table using paint and a distressing technique. 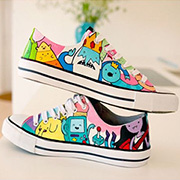 You don't even need to be artistic to create your own wall art! 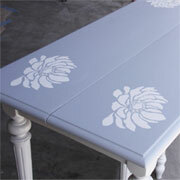 Making your own stencils is easy and you can make stencils in any design you want. 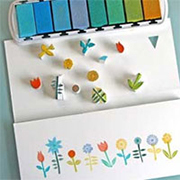 Here's how to design and create your own stencils. With a can or two of Rust-Oleum 2X or Painter's Touch spray paint you can liven up your kitchen colour scheme. 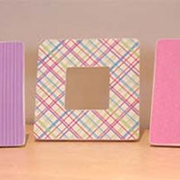 These frames cost around R20 each at home decor stores, and it takes less than 30 minutes to complete three of them! This oak buffet was gathering dust in a garage before being restored to its original glory. 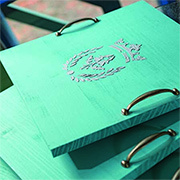 Stencils have come a long way; today’s options are sophisticated, easy to use, and offer you endless design possibilities. Combine your favourite pattern and paint colour for a shade that makes a personal statement in a bedroom, bath, home office, or anywhere you want to add privacy. 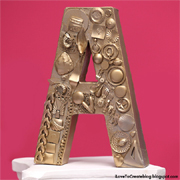 Rubber stamping is the latest trend for adding unique touches to a wall, border, fabric, furniture - in fact you can stamp onto almost anything! 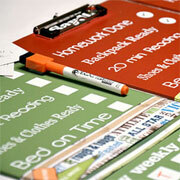 It's fun, it's easy and it's definitely a fun way to add your own personal touch. 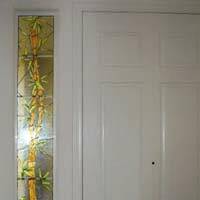 Some self-adhesive vinyl, glass stain or Rust-Oleum paint pens and liquid lead are all that you need to create your own stained glass window. 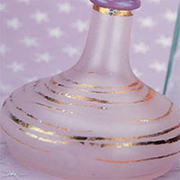 Don't throw away empty bottles, transform them with Rust-Oleum Leafing Pens or metallic craft paint. Andrea Vogel, one of our readers, shows you how easy it is to transform a dated melamine bookshelf into a stylish and modern shelf display unit with paint. 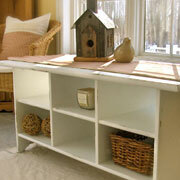 In this project, we transform an old cabinet door into an elegant serving tray. We designed a classic white tray with black detailing, but you can choose any colours. 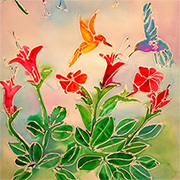 Silk screen printing is a fairly simple printing technique that - with a few essential materials - is easy to master. 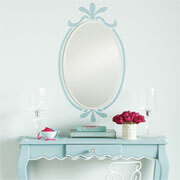 A made-over dresser and mirror (along with new window treatments) turn this wall into a glamorous focal point. Create a mosaic-effect border with a Moroccan flavour for a kitchen tablecloth using one simple stencil and a subtle blue and aqua colour combination. Paint is not just for using on walls. There are so many ways that you can use paint to update your home - and furniture - and save money on replacing items by simply giving them a new look. 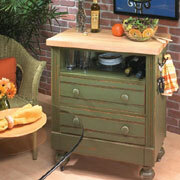 Transform an ordinary piece of furniture into an antique piece with a little bit of paint and glaze. 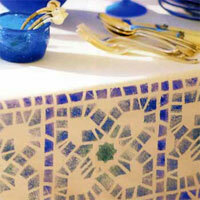 The secret to painting this faux-mosaic table top? Dot stickers. Plus some white paint followed by a few coats of fabulous French blue paint. Add matching French bistro chairs and an old chandelier, and you’re ready for an al fresco candlelight dinner.